Dear Jack Wilshere I’m worried about you. Yours sincerely, a concerned fan. Late last week, I opened up the Twitter application on my phone and perused my timeline. To my dismay, I discovered that Jack Wilshere had once again been struck down with – at least what seems to be becoming – his biannual injury, and that he would require yet more surgery. I reacted in a fashion similar to the one in which most Arsenal fans would have; with a sigh and a shake of the head. You see, by now we’ve become all too familiar with this process. It really is a shame. 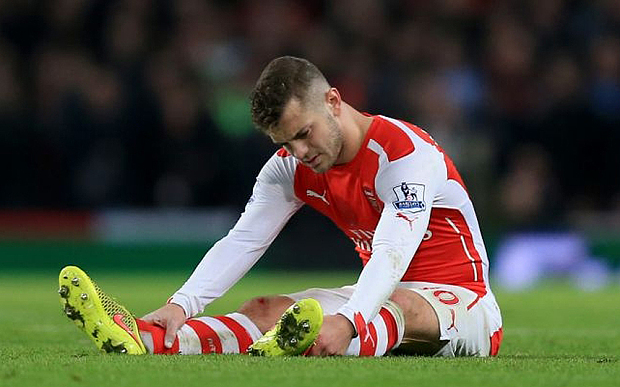 According to fluttering reports, Wilshere will miss the first eight weeks of the season with a hairline fracture to his fibula – an injury sustained in training. A late session in the transfer window seems an unnecessary move in the short term, but if his unintentional proclivity for treatment continues, Wenger may have to look elsewhere. I should probably mention at this point that I like Jack Wilshere, and that he’s a player I admire for a whole batch of reasons. Footballistically speaking – as Arsene would no doubt phrase it – his technique is dazzling. The intricacy, pace and determination with which he plays are a complete credit to both his talent and to his attitude. Whether you’re talking about driving play forwards in an aggressive and direct manner, or about playing neat and dangerous passes in crowded areas, there is no player better at my club than Jack Wilshere. Not even Mesut Ozil. I remember the first occasion in which he really caught my attention. Our nerve-rattling encounter at home to Barcelona in the spring of 2011 arrowed severe shockwaves around European football. A young English starlet had truly arrived. Jack’s marvellous solitary performance on that bone-chilling night sweetly demonstrated his ability to step up his game when it really mattered. I was sure that from that point on, Arsenal finally had a young midfielder with truly world class potential at their disposal, and one that could transform a depleted and lacking English national team. Needless to say, I hardly expected the injury difficulties and personal troubles that would bombard him throughout his development. Whilst reading the Daily Mail’s sports section one morning earlier this week – yes, I read the Daily Mail – I came across a small, revealing feature that showcased the true extent to which Jack Wilshere has been out of action since his promotion to the first team in 2009. The insert revealed that during his Arsenal career, Jack has been in the treatment room – for a period of time longer than a fortnight – a whole thirteen times. I was shocked. Two more startling statistics noted that his longest lay-off was a fourteen month break between 2011 and 2013, and 75% of his injury spells have been ankle-related. It’s hard not to feel sorry for the man. But it swiftly poses the question; what is the underlying cause of his woes? It’s hard to argue that he has been overplayed since about 2011, as much of the time spent subsequently has been on either the bench or the treatment table, rather than on the pitch. You could, at least theoretically, dispute the manager’s training methods. Arsene Wenger has been slammed by pundits and former players in the past for overly-rigorous training regimes. Let’s not forget that Wilshere is hardly the first or last to experience chronic health and fitness problems at the club. Names like Mathieu Debuchy, Theo Walcott, Oxlade-Chamberlain and Kieran Gibbs immediately come to mind. It would also be plausible to suggest that perhaps long-term damage has already been inflicted upon Jack’s legs, and that it is only a matter of time before he is rendered physically incapable of mounting a credible career at Arsenal football club. The human body, after all, can only take so much. Whatever the answer, the picture is bleak. I don’t have the answers, and nor do I claim that I have, but I’m worried for an athlete for whom I hold much respect and admiration. It is simply inconceivable that my childhood team could go without their most naturally home-grown talismanic personality in two decades for much longer. Jack Wilshere is a special case. His talent shouldn’t go wasted and unpreserved, but should be nurtured and micromanaged. If he is to once again be forced out of action for a couple of months, then serious steps should be taken to ensure his long-term survival. Steps like formulating a new fitness and dietary program, carrying out more extensive research on methods of relieving pressure upon his tendons and joints, or even being more intelligent when deciding when and where to play him. I often sit and wonder what the future looks like for Arsenal’s number 10. Even his squad number implies significance within the team. He was, after all, given it for a reason. Seldom do I correctly predict the future – particularly when it comes to sporting endeavours – but I am, without doubt, concerned for Mr Jack Wilshere. I can only hope that when I look back on his professional career and honours in ten or fifteen years, that my worst fears were not realised. I hope that Jack regains his consistency, avoids any more career-threatening injuries and shows both our fans and world football that we were all correct in touting him so highly only a few years ago. I’m counting on you Jack, please don’t let me down. I'm from South-East London and I'm a second year student of journalism at the University of Arts, Elephant & Castle. I'm a semi-regular at the Emirates, avid writer and keen to express my views on my boyhood club. Thanks to all who visit and read. Will Alexis Claude Maurice follow Guendouzi to be the next Gooner off the Lorient Express? Introducing PeloTonyAdaMS: another Arsenal team that needs your support – EXCLUSIVE MUST READ! One Response to Dear Jack Wilshere I’m worried about you. Yours sincerely, a concerned fan. I agree with much of the sentiment here Oliver, that night against Barcelona, he really looked like he belonged on that pitch with the wonderful array of talent on display. Where I disagree with you is the notion that Wenger’s training regimes are somehow more vigourous than his other counterparts at rival clubs. Much of this rumour is down to former Wales assistant manager and fitness coach Raymond Verheijen, who was bemoaning the fact that Aaron Ramsey couldn’t play in a international match because of injury. Verheijen himself has never been privvy to Arsene’s methods. Former players like Martin Keown have stated that Wenger’s methods are no more stringent than other coaches he’s worked with. However there’s no hiding behind the fact that we do seem to get more of our fair share of injuries. Are our players made of biscuits perhaps? It’s when you look at the injuries you see that the vast majority are not down to training methods. You mentioned Debuchy, who broke his leg during a game, no sooner was he back, when he broke his collar bone after a needless challenge from a Stoke player that went unpunished. Jack’s own ankle injuries started to occur after a ridiculous challenge in a pre season friendly gainst NY Red Bulls a few years ago, although it does beggar belief he can pick up an ankle injury in training considering his history. I remember watching the Man U game at the Emirates last season and the cynic in me felt that Wilshere’s ankles were being targeted. The challenge by United’s Paddy McNair that put him out for months was apparently not even worthy of a free kick. I share you’re worry, as we’ve seen what a dreadful challenge in the last few minutes of a match that was long since over as contest did to Abou Diaby’s career. I think it right we should ask questions about training methods, but let’s not neglect the evidence of our own eyes, when we see rough treatment handed out to certain players during games.